After Jesus’ death, the apostles chose seven men to assist them in the work of running the church and teaching the gospel. One of these seven was Stephen, a man with a strong reputation for loving and following God. He, with the others, were set apart to their new role through the laying on of hands, which means the apostles placed their hands on Stephen’s head, gave him a blessing from God, and conveyed the authority from God to do his work. Stephen quickly encountered difficulties. He was falsely accused of blasphemy and brought before a council. They may have been surprised, as they leveled their accusations, to see that Stephen was transfigured. He had the face of an angel. This was something the people did not want to hear. They didn’t want to cope with his vision so they came after him. 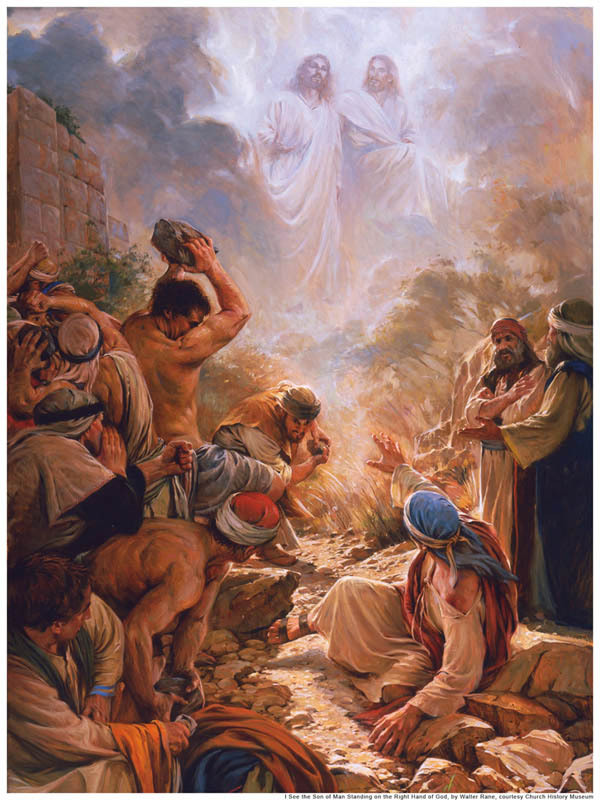 They forced him out of the city and then stoned him. He died calling upon God. This powerful moment in New Testament history teaches us many valuable lessons about God, Jesus Christ, and the responsibilities of Christian. Choosing to be a follower of Jesus Christ is seldom easy, particularly if one chooses to be vocal about one’s beliefs. Sharing the gospel is a commandment for everyone, not just those specifically called to do so. When we take the Savior’s name on ourselves, we agree to share His gospel with others, even when there are consequences. Few of us will be asked to die for our faith, as Stephen was, but we will be asked to live for our faith, and sometimes that is harder. It is the day to day challenges that can make life seem more challenging and test our courage. However, those challenges build our faith and tell us the depth of our commitment to eternal things. Many verses in the Bible testify that God and Jesus Christ are unified in their work, testimonies, and their doctrine, but that they are entirely separate beings in every other way. The vision of Stephen, for which he was killed, is one such testimony. He saw Jesus on God’s right side. Both were standing—and the Holy Ghost was in Stephen, so all three were present. We see this presence of all three at Jesus’ baptism, also. It is no accident that God chose to show Stephen the nature of God and not a surprise that he did not react with shock to this doctrine, since it was commonly known in his own time. His listeners objected only to the information that Jesus truly was divine and alive, not that He was a separate being from God. We note that Stephen could see both Jesus and God. This reveals the true nature of God as one who has a body, but a perfected body. It reinforces God’s promise that we were created in His image, not in some random form. Parents and children are designed to look alike and God, loving us, wants us to have every good thing He has, as does any loving parent.